In varietate concordia! Often chanted to recall the uniqueness of the European integration project, the EU’s motto may have turned against it in the context of increasing regional claims for secession in different member states. From Catalonia to Scotland—not to mention Veneto, Flanders, the Basque region, South Tyrol, and Corsica—separatist movements are more present across the old continent than ever. While Catalonian and Venetian activists organized public claims devoid of any legal value, Scots went to the polls last September to respond to a referendum authorised by authorities in the UK. Despite the lost campaign for Scottish independence, the deep tensions behind the referendum lifted the veil of the stateless-nations taboo. If such separatist aspirations involve obvious constitutional contentions, which are specific to each state, the issue deserves to be contemplated in the context of European integration. Indeed, of varying intensity and credibility, these movements—whether supported by political parties or not—raise the question of whether they threaten European integration, or whether they are the inevitable consequence of it. A changing right of self-determination in the EU? Traditionally, secession is deeply rooted in the right of self-determination—a remnant of the decolonization process—and thus conflicts with two other cornerstones of international law: states’ sovereignty and territorial integrity. Dealing with Quebec’s aspiration for independence, the Canadian Supreme Court tried in an advisory opinion to shape the conditions of a remedial secession and identified three situations in which a people is entitled to external self-determination: (i) a people of a former colony, (ii) a people that is oppressed, (iii) a definable group that is denied meaningful access to government to pursue their political, economic, social, and cultural development. Thus, the ICJ relied on the massive human rights abuses suffered by Kosovars to find that the unilateral declaration of independence of Kosovo was not contrary to international law. Hence, if the rhetoric of self-determination has become a mainstay of separatist movements, it is clear that international law does not grant them with a right of unilateral secession, as long as they truly enjoy their right of self-determination within the existing state, for example if given autonomy in political and cultural matters. The EU has to face claims of independence of a new and unique kind that deviate from the classic international law framework. In weakening notions of statehood and sovereignty, the EU integration process is seen by some as having fathered sub-state nationalist aspirations. So much so that some political nationalist parties have built their claims in underlining the opportunity given by the uniqueness of the EU. Next door to the SNP’s campaign in Europe.pdf?sequence=1 of “independence in Europe” in the 1980s, the Catalans already envisioned Catalonia as “new European state”. However, European law supports such aspirations no more so than does international law. States remain central in the EU process and new national entities would be denied automatic access as a member. They would have to apply for a membership and fulfill the established requirements. Above all, asserting that the European Union encourages such movements is total nonsense, because they are at odds with the EU’s actual goals. This would be forgetting a critical component of the European Union’s construction: solidarity. 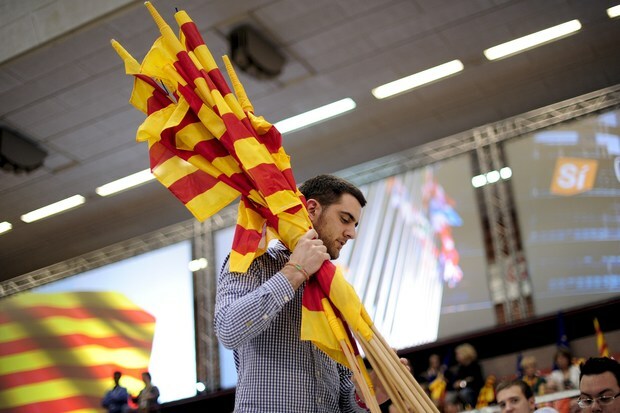 Yet in most of the cases—especially Flanders, Veneto and Catalonia—the regions wishing to secede argue selfishly that they are the economic lungs of the state. By breaking away, they simply want to get rid of their onerous economic ties bailing out the poorest regions. But, how can we expect solidarity at the European level when solidarity is non-existent within individual member states? Separatists don’t seem to be fully aware that an inherent compromise for taking part in the common market is accepting trade with any single area of the EU, from the richest to the poorest. So, much more than embodying a contrast with the process of integration, such movements endanger the realisation of the single market. Particularly disquieting is the fact that such independence ambitions hit member states at the heart of the European Union. That’s why the EU should not stand by and watch. The regions are an issue of paramount importance for EU, and the best solution probably lies in the promotion of regional identities by providing a strong forum for them on the European stage. By regions, I mean the local level—that is to say, sub-state entities, but also regional spaces at the European scale. The truth is that the EU has already in hand the key tools to allow regions to participate in policymaking, but such tools remain sadly underused. Significantly, the Maastricht Treaty both introduced the principle of subsidiarity and established the Committee of Regions. In particular, subsidiarity should be strengthened, or even rethought. According to that principle, authority over any given area of competency should be vested at the most efficient political level, namely at the lowest possible one. I personally have high expectations for the new Commission team that seems to want to rely extensively on subsidiarity in order to add a new momentum to the common market. A greater cooperation among the different levels of decision-making and especially with the local level would be very welcomed. Regions embody positive assets for both the EU and its member states, in that they bring cultural and linguistic diversity, and thus they need to be pampered. They should not though be considered to be adversarial to the states. The only winning way for all parties involved—namely regions, states and the EU—is to promote cooperation among all these levels and in so doing, to ease separatist tensions. An effective application of subsidiarity implies that decisions are to be made as closely as possible to European citizens. Hence, when seeking to minimize the effects of boundaries between member states, the EU should not allow regional separatist trends to raise new borders between European citizens. This is what is meant by the EU’s motto: united in diversity.